Years ago, I became fascinated with a hotel in Portland, Maine, though I’m not sure why. The Inn at St. John is a basic hotel near the bus station, not gritty enough to explain my fascination. I’ve never been in, but pictures on the website show velvet curtains and furniture that’s meant to look Victorian. Quotes promise that it’s "comfortable and a good value" and “CLEAN!” It offers three room tiers: pet-friendly rooms, economically priced rooms for extended visits, or romantic luxury accommodations for weekend getaways. If you want any of these things, it says, the hotel is exactly what you’re looking for. There’s something touching in this accommodation. I like how the hotel wants to be everything for everyone, and can’t hide this. How eagerness and sincerity linger a millimeter beneath its reach for class, and lurking beneath that is what I imagine is the truth—it won’t be as shabby as I had hoped, and it will cost more than I thought to find this out. Maybe I like how it misses every sort of mark. But what I like best is that it rents rooms by the week, offering a home to people, however temporary. For a while I thought I might stay there. I wanted to live in Portland for a week or two and write, and I talked about this frequently. I had a friend who lived in Portland who offered her spare bedroom, but I wanted a hotel. The Inn at St. John was the cheapest place I could find. My friend was working for a crisis hotline and said that many calls came from there. I imagined all the solitary rooms with all the telephones, stretching through the hotel, trying to reach someone. It made me want to stay there more, but I never did, because of the money, and inaction, and other things. I was married back then and living seventy-five miles north of Portland, inland, in an isolated college town. I had also become interested in antique nautical maps, and I had planned—if I’m remembering correctly—to spend time in a map library while staying at The Inn at St. John. Later I was talking to someone at a bar, trying to account for this period of my life, and said something like, “Something happened and for some reason I became very interested in maps.” He nodded at my shorthand, and I think he understood what I was trying to say. I’ve still never been to The Inn at St. John, and considered going so I could describe it here: the woman who checked me in, the walk through the halls, the view out the window. I've noticed that sometimes original and unintelligible urges play themselves out later in distorted forms. 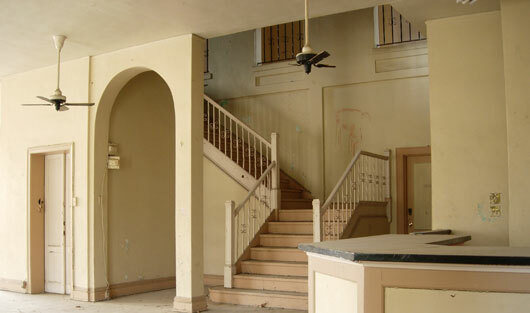 Perhaps the building where I now live appealed to me because it was run-down and I was told, when looking at it, that it might have been a hotel once. It was the cheapest place I could find, and it’s a little sad—people yell in the halls, bare bulbs burn out—but there’s also an innocence to it, mostly people live there in ways you can't quite guess at. To read “Saint Andrews Hotel” in full, Purchase APS 8 or Subscribe today. ​Sara Majka recently completed her MFA from the Bennington Writing Seminars. She has stories coming out in The Massachusetts Review and H.O.W., and lives in Northampton, Massachusetts, where she assists at Small Beer Press.